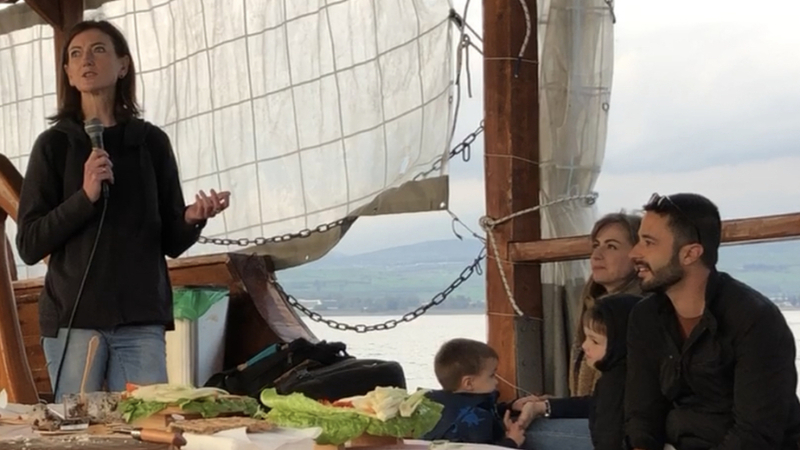 Moshe and Jeannette Gabay and their sons listen as Pastor Catrina Henderson shares on the Sea of Galilee. “It is pretty much one hundred per cent that Jesus preached here,” our tour guide Moshe tells us. We’re at Magdala in northern Israel at the archaeological site of the Migdal Synagogue that dates back to the first century. Magdala was an ancient city on the shore of the Sea of Galilee, just under 5km north of Tiberias, which still exists today. It is believed to have been the hometown of Mary of Magdalene (Mary of Magdala). I find myself suddenly overwhelmed. My eyes fill with tears. This is unexpected. The synagogue found at Magdala is one of just seven found in Israel that date back to the first century and the oldest found in the Galilee region. A coin minted in the area in 29 CE was found inside the synagogue during its excavation, dating it to the time of Christ’s ministry. The building is well preserved (as far as ancient ruins go) and includes the Magdala Stone, which depicts the oldest carved image of the Second Temple’s seven-branched menorah ever found. As I stand and look at the sanctuary with its tiered seating and imagine what it might have been like to sit on one of those stone benches and listen to Jesus teach, I find myself suddenly overwhelmed. My eyes fill with tears. This is unexpected. Magdala’s discovery story also strikes a chord: In 2004, Father Juan Solana, a papal appointee who was in charge of a house that Catholic Christians stayed at in Jerusalem, felt God leading him to build a similar retreat centre in the Galilee region. Father Juan and his team bought an area that was then called “Hawaii beach” – a rather tacky-looking holiday park complete with beach umbrellas and bungalows. He contracted architects, got a grant from the Israeli Ministry of Tourism, bought the other parcels of land needed, and even had Pope Benedict XVI bless the cornerstone for Magdala retreat when he visited in May 2009. In July 2009, Israeli Antiquities Authority archaeologists began a five-month mandatory excavation at the site of the new retreat. In September, their excavations had made a remarkable discovery – a First-Century Synagogue where Jesus himself had taught. 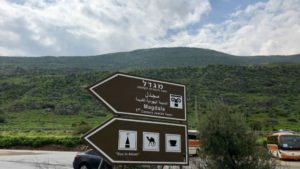 Earlier that day, tour guide Moshe had taken my group on a 17km trek – one day’s worth of a four-day hike from Nazareth to Capernaum that he leads called The Jesus Trek. When I meet the group of pastors (brought together by their affiliation with the Hillsong Network) at Magdala they are muddy (Israel has had more rain this year than it has seen in years) but clearly energised. They’ve just hiked for hours in drizzling rain and yet every single person is buzzing. Neither the synagogue at Magdela nor these enthusiastic pastors are what I envisioned tourism in the “Holy Land” to look like. 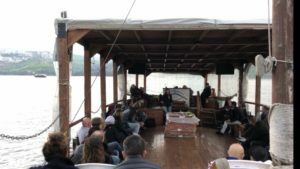 Late that afternoon, the group sets sail on the Sea of Galilee, sharing wine and cheese as Moshe points to the shoreline, pointing out Capernaum where it is believed the first followers of Jesus met at Peter’s house to study and “remember” Jesus, forming the first house church. “According to Jewish tradition, studying and spreading the message of your teacher at a personal location is the best way to remember him. Jesus asked us to remember him and that is what probably created the first house church at Peter’s house in Capernaum,” Moshe says. One pastor reads the story of Jesus calming the storm as he and his disciples sailed on a boat similar to the one we’re in. Various members of the tour group take turns reflecting on the story from their new vantage point of being in a boat on the Sea of Galilee. Next – perhaps because their reflections aren’t quite getting it, or perhaps because the Almighty decides to bless the group with the full experience – the heavens open in deluge. The group huddles towards the centre of the boat under the cover and sings Hillsong UNITED’s song Oceans – a fitting response, especially since the group filmed its video to go with the album in the region. Once docked, we dash to the tour bus that drives us just five minutes down the road to the Pagoda restaurant. A woman who I presume to be the owner greets us warmly and lets us know that dinner will be ready soon – Shabbat has only ended an hour ago, so the cooking has just begun. She’s made us soup, because “what is better in this weather than soup?” Moments later we begin eating – freshly cooked bread and hummus, the promised soup, salad and, of course, freshly caught fish from the Sea of Galilee. The following day, Moshe’s wife Jeannette takes me to see the ruins that are believed to be Peter’s house in Capernaum and the first church, and then on to the Mount of Beatitudes. As I weave through the beautiful gardens surrounding the church built on the Mount of Beatitudes with Jeannette and her sons, the tourists I had envisioned become a reality. We see older groups gathered around American tour guides, who are preaching. There are also many Italian Catholics. Some of the groups sing worship. It’s a lovely atmosphere, even if it does fit the stereotype. Moshe has an Israeli father and Swiss mother. He grew up in Switzerland and came here when he was 19, doing his three years of army service that all Israeli young people do. After his service, Moshe was speaking with his mum, who told him he should bring churches to Israel. She’s always tried to convince her Swiss congregation to go to Israel but had no success. Her words resonated with Moshe, who had the same longing on his heart to see believers experience the land and connect better with Jesus, and he got busy becoming a general tour guide and then bringing churches to Israel. Jeannette was the foreign affairs officer of the European Christian Political Youth movement, which was working on bringing youth to Israel and was arranging lectures for Moshe’s Israeli team in the Netherlands. The two got to know each other and were married in the summer of 2013. They’re a formidable couple – humble and gently spoken, and a seemingly endless well of understanding. If anyone’s equipped for the challenge of reimagining tourism in the Holy Land, it’s the winsome Jeannette and Moshe Gabay. They’re convinced that seeing the places where Jesus lived and ministered will deepen the faith of Christians of all ages and all cultures. “Our passion is to bring people closer to Jesus by traveling to the land that he called home,” Moshe tells me – a refreshingly understated vision in a country whose hotel foyers are crammed with overstated tour guides talking about Leviticus and latter days. He’s preaching to the choir’s newest member when it comes to promoting Israel. I have ended up in Israel only because I have been generously invited by the NSW Jewish Board of Deputies to take part in a peace-building study tour with Breaking Bread Journeys (another tour company that’s reimagining tourism in the region) the following week. Israel might not have been on my list of places to see before I retired, but after two days of seeing the Galilee region where 80 per cent of Jesus’ ministry took place, after standing on the beach where it’s believed the resurrected Jesus fried up breakfast for the disciples, I’m sold. Now every time I open my Bible to read the gospels, the account comes to life and it feels as though I’m reading it for the first time. It’s an invaluable gift to a woman who’s been reading her Bible for 37 years. On the way back to Tel Aviv, Jeanette and I wonder together how to describe the spiritual experience of being in the same place that Jesus ministered in. “Many people say that visiting Israel is reading the fifth gospel,” Jeanette tells me. And that is as good a description of the Holy Land as any I can think of.